Disk Map makes it easy to visualize the files and folders that are cluttering up your storage drives. It enables you to quickly locate, delete or compress large files and folders on your hard drive and reclaim valuable space. 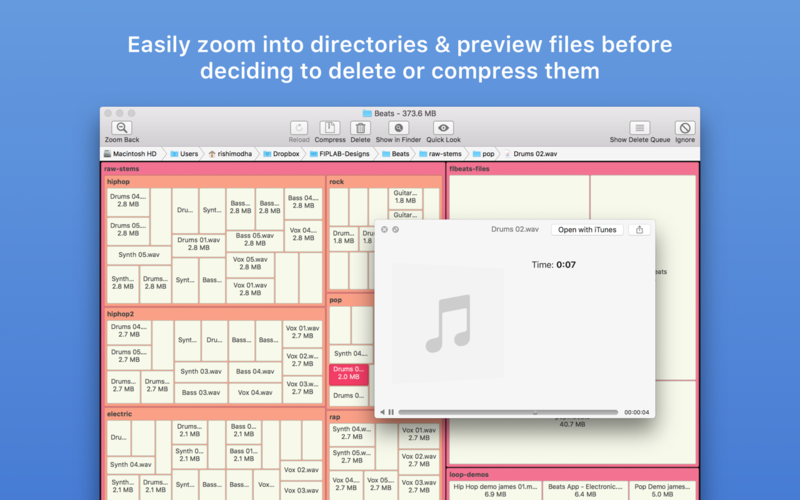 The app quickly scans your drives to build a stunning treemap visual display of files and folders on your computer, allowing you to easily navigate through your file system and find out what is taking up the most space. We’ve worked hard to make Disk Map as simple and efficient as possible for you to use. We would love to hear your thoughts via email and make any improvements to future versions of this app. We intend to have an active development cycle powered by your feedback, love and support!